The Philippines has launched an investigation into the immunisation of 730,000 children with a dengue vaccine that could pose health risks. Last week French drug company Sanofi announced its vaccine could worsen the potentially deadly disease in people not previously infected. The public immunisation programme was suspended on Friday. 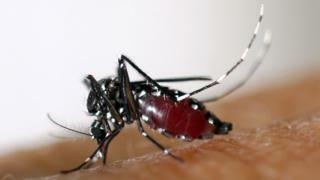 Dengue fever affects more than 400 million people each year around the world. Sanofi's Dengvaxia is the first-ever approved dengue vaccine. In addition to the Philippines, the company said the vaccine was registered in Argentina, Australia, Bangladesh, Bolivia, Brazil, Cambodia, Costa Rica, El Salvador, Guatemala, Honduras, Indonesia, Malaysia, Mexico, Paraguay, Peru, Singapore, Thailand and Venezuela. The vaccine has also been used in a public immunisation programme in Brazil which, combined with the Philippines scheme, has to date provided around one million people at least one dose of drug. Sanofi said in a press conference on Monday that there had been no reported deaths related to its dengue vaccine in the Philippines. "As far as we know, as far as we are made aware, there are no reported deaths that are related to dengue vaccination," the company's medical director, Ruby Dizon, told reporters on Monday. "Of course, rest assured, monitoring is continuing, we are working with the department of health (DOH), in collaboration, to make sure this is maintained." Philippine presidential spokesperson Harry Roque said on Monday that "people should not panic over the dengue vaccine" as the government was looking into the matter. Dengue is a viral infection which causes a severe, flu-like illness that can be fatal if it develops into its most serious form. The global incidence of dengue has risen dramatically in recent decades, according to the WHO, putting about half the world's population at risk of the disease. Sanofi said last week that a new long-term study had shown that while the Dengvaxia vaccine worked with people who had prior infection, it posed a risk for those who hadn't. "For those not previously infected by dengue virus, the analysis found that in the longer term, more cases of severe disease could occur following vaccination upon a subsequent dengue infection," the company said in a statement. The French drug maker said it would ask health authorities to update the information given to doctors and patients working with the vaccine. In its latest advice on the vaccine, the WHO recommended that Dengvaxia should only be administered to "subjects that are known to have been infected with dengue prior to vaccination," pending a full review of the study.